Model M .380 from 1929-30 period used by United Air Lines. 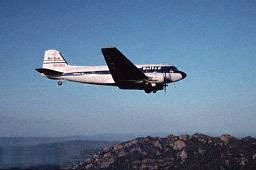 Before W.W.II, there were shipments of Model Ms to various air lines. According to one source, before W.W.II, there was a requirement for commercial air line pilots to be armed. 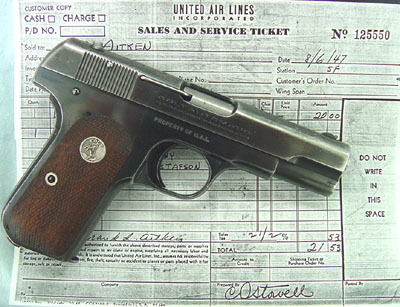 This gun is marked "Property of United Air Lines" on the right side of the frame above the grip. These markings are not believed to be factory. 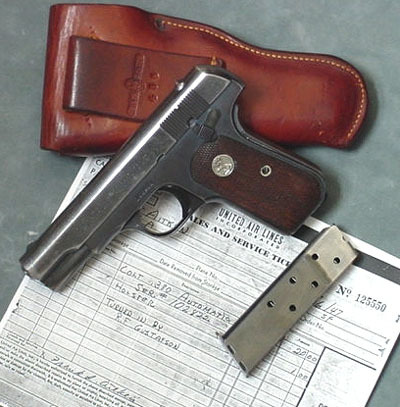 A second gun, also a .380 ACP and marked in the exact same manner, were accompanied by "Hibbard" marked brown flap holsters. The backs of the holsters have been modified and appear to have been configured in a way that allowed them to be fastened to the plane either by snaps or by another type of fastener. They have been converted back to a hip holster configuration. 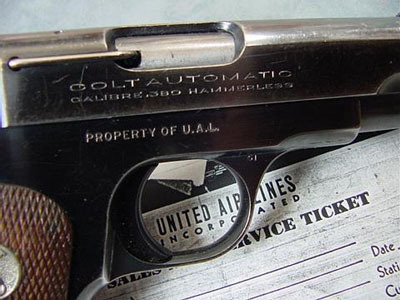 Another United Air Lines Colt Model M .380 marked "PROPERTY OF U.A.L". Serial number 102822. 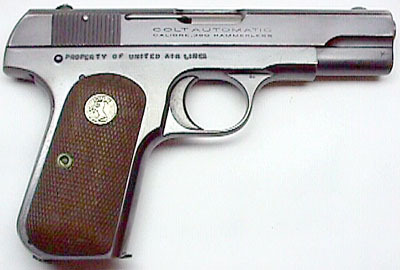 Like the example above, this marking was not applied at Colt, but after the gun was purchased. 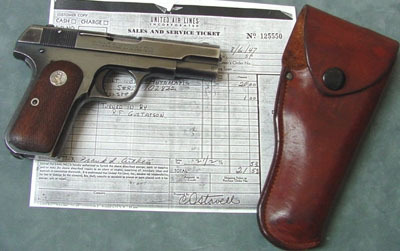 Accompanying this pistol is the original Bill of Sale dated August 6, 1947. The invoice contains the notation "Turned in by R.F. Gustafson". 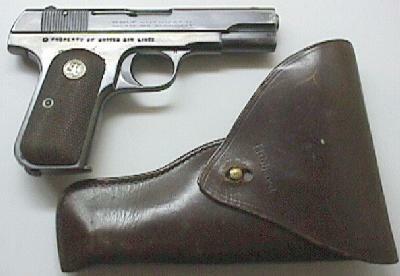 This pistol is accompanied by a commercial Heiser flap holster. The property markings on these guns were not applied by roll mark ,as they would have been if applied at Colt, but are individually stamped letters.